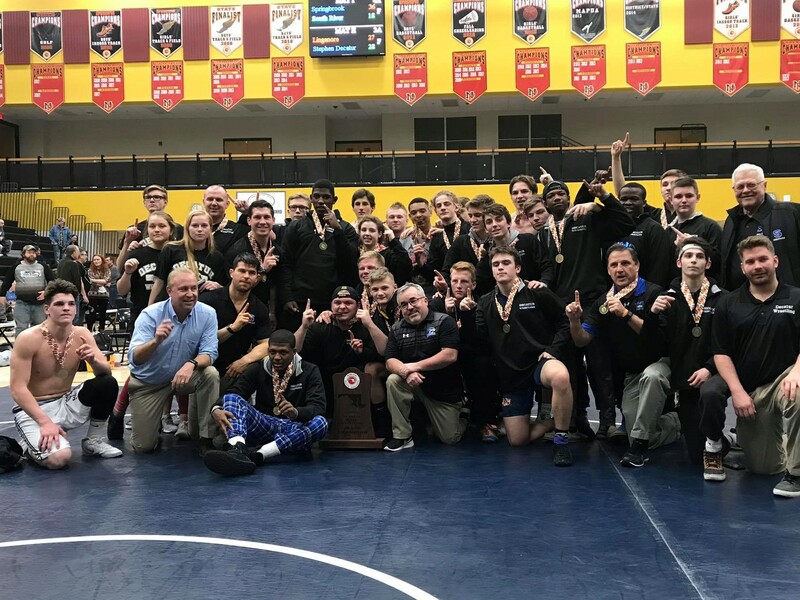 BERLIN — It came down to the last bout on a long day, but Stephen Decatur’s varsity wrestling team edged Linganore, 28-27, in a tight match last Saturday to capture the state Class 3A championship. The undefeated Seahawks dominated all season, but it took every last ounce of effort to capture the state championship last Saturday at North Point High School. Decatur entered the state dual meet championships as the number-two seed and edged third-seeded Bel Air, 32-30 in the semifinals. The win over Bel Air put the Seahawks in the state championship match against top-seeded Linganore and the match certainly lived up to the hype. Decatur trailed Linganore by four points heading into the final bout of the night at 182 between the Seahawks’ Micah Bourne and the Lancers’ Hope Baguio. Bourne basically needed a pin to get the state championship win for the Seahawks and did just that to put Decatur ahead, 29-27. However, Decatur was docked one point when the Seahawk faithful celebrated a little too enthusiastically and the margin was cut to 28-27. Nonetheless, the narrowest of margins was enough to capture the state championship for Decatur. 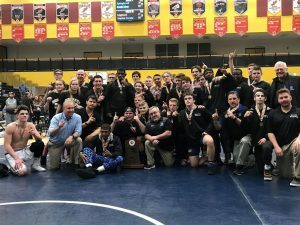 Ironically, it was Bourne who started the night with a big win in the opening bout of the semifinals against Bel Air and Bourne again in the final bout of the night in the championship against Linganore. Against Bel Air, Bourne beat Noah Beyers at 182, Lukas Layton beat Jarritt Stencil and 195, D.J. Taylor beat Jack Brink at 220, Dakota Souder beat Jasanveer Aulakh at 285 and Shamar Barnes beat Kyle Heidel at 106. Bel Air then won three straight at 113, 120 and 126 before Noah Reho stopped the run with a win over Daniel Cross at 132. After that, the two teams swapped wins through the middle weights. In the last win of the match for Decatur, Kyle Elliott beat Grant Cole at 145, but the Seahawks had earned enough points to advance with the 32-30 win. In the championship match against Linganore, the Lancers started fast with wins at 195 and 220 before Souder got the Seahawks on the board with a win over Scott Hommel. Barnes beat Sean Mullineaux at 106 and Anya Knappenberger beat Noah Jedlowski at 113. Jagger Clapsadle kept Decatur rolling with a win over Aidan Flint at 120, but Linganore won the next two at 126 and 132. Reho beat Frank Dickenson at 138, but Elliott lost at 145. Jhymir Blake got Decatur back on the board at 152, but Linganore won the next two at 160 and 170, setting up the dramatic final bout between Bourne and Baguio at 182 for all the marbles.